An Orthodox Jewish man who spoke out against Israel’s bombing of Gaza has fled his home after it was vandalised twice and he was assaulted. Downstairs windows at the property in Curzon Road, Higher Broughton, Salford, were smashed, eggs thrown at the property and graffiti daubed on the door and window sill. The victim’s car was sprayed with red paint. Police say they are treating the attacks as hate crimes. The man is understood to have moved out of the terraced property after being targeted by a mob of up to 30 people. 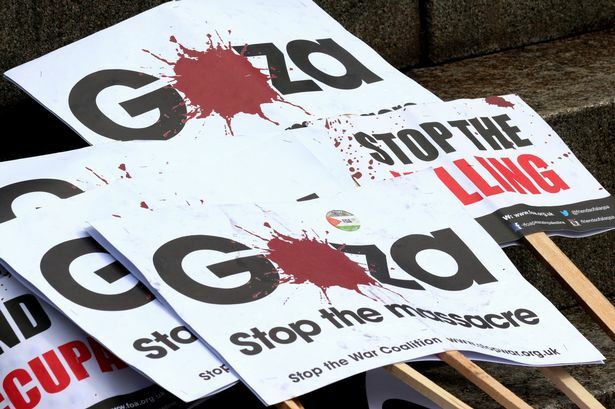 The victim had expressed his views in the local community and also on King Street, in Manchester city centre, which has been the scene of protests by pro-Palestinian and pro-Israeli groups. The man’s home now has a To Let sign up and the downstairs windows are still boarded up, with eggshells on the doorstep. One neighbour told the M.E.N: “It was a Wednesday night, just before midnight. We heard this almighty commotion in the street. Shocking bawling and swearing. “There was fighting going on and someone was trying to keep the peace and keep people apart. “We assume the man who lived in the house has been hounded out. They added: “The police came around and interviewed everybody the next day. “They said there was a suggestion there might be a protest outside the man’s house and said we might want to move our car. GMP said: “Between July 28 and 31 police were called to Curzon Road, Higher Broughton, following reports of criminal damage and assault. “At midnight on July 28, 2014, eggs were thrown at a house on Curzon Road. “At around 11.40pm on July 30th a man was approached and assaulted. The offender ran off onto Great Clowes Street.